In most cases you would start and stop recording audio manually. However, there are situations when a kind of automatic sound recorder is required. Such recorder would start recoding when some audio activity is detected and stop recording when nothing happens. This can be used for various sorts of monitoring purposes. 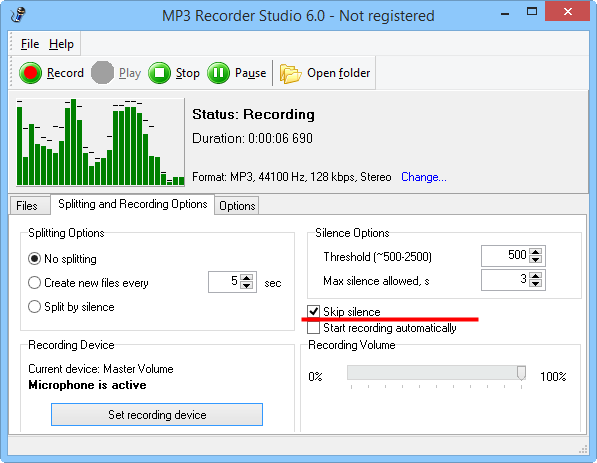 MP3 Recorder Studio includes a silence detection tool that allows you to skip silence while recording audio. By default, it is not enabled. To enable skipping silence, start the program, switch to the "Splitting and Recording Options" tab in the lower part of the window and click on the "Skip silence" option. Changes come into effect immediately. You can click the "Record" button to start recording audio. If no sound is detected by the program, nothing will be recorded. As soon as some activity is detected, MP3 Recorder Studio starts recording. Threshold allows adjusting sensitivity of the silence detection tool. If sensitivity is too high (low threshold value), MP3 Recorder Studio may catch even very faint sounds, like your breath or some sounds in your room, when microphone is used. Higher threshold values allow ignoring quiet sounds, reducing sensitivity of the silence detection tool. Max silence allowed is time in seconds during which MP3 Recorder Studio should ignore silence. A typical conversation includes pauses, and it is likely that you'd like to keep them instead of turning everything into a gabble. As an example, we can take an audio book. Pauses in an audio book are used to emphasize some thought or to separate one logical part from another, removing them may change the effect. On this very tab, you can also take a look at the "Splitting Options" area. The silence detection tool can also be used to split files. In our example, we simply skip silence and record everything into a single file. However, you can use the "Split by silence" option to start a new file after each significant pause (as defined by the "Max silence allowed, s" field).